My teen and I have always enjoyed sharing a great meal and trying out a new restaurant. Its a time to slow down, catch up and savor every bite of delicious food without rushing to whatever is next on our to do list! My daughter recently had a birthday and I took her to the mall so she use some of the gift cards she received. Afterwards, we headed over to DVine , a Mediterranean Experience, in Brea, Ca, where we were invited to sample the menu. Mediterranean food is one of our favorites so we were excited to try this restaurant! Now that our kids are a bit older, selecting a restaurant is not the same as it was when they were little. We used to be able to select anywhere we wanted, knowing there would be a kid’s menu with a typical kid-friendly offering. They have developed tastes and preferences and are a big part in the selection process now. Luckily I have good eaters who are willing to explore new flavors. DVine has two locations – Fullerton and Brea, Ca. 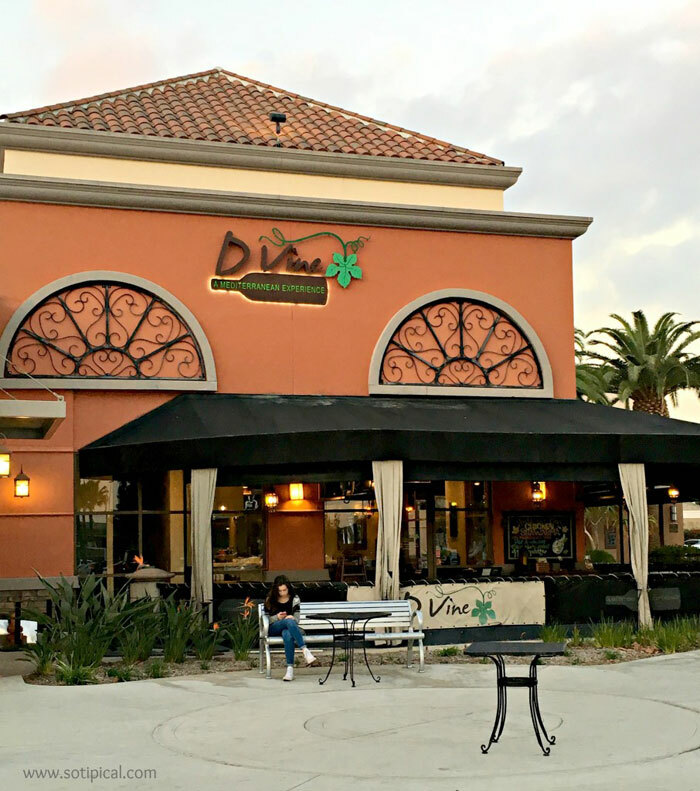 D’Vine offers some of the finest Mediterranean food in North Orange County. Their amazing Mediterranean dishes are traditional and healthy. Savory spices, tantalizing sauces, house dressings and meat served fresh off the grill! Founders, Walid Alarja and Lena Quezada bring together years of family tradition and experience with a fresh take on Mediterranean dining! This is definitely the type of dining we love! While we explored the MENU, our server brought us Pita Chips with Olive Oil and Za’atar seasoning. Yum! Next we were welcomed by Jamal, the restaurant manager who offered up recommendations and popular menu items. Everything sounded amazing so we let him “surprise us” with our dinner selections. We then enjoyed a Cold Mezza plate which had Hummus, Baba Ghanoush, Tabouleh Salad, Cucumber Yogurt Salad and warm pita. We loved it all, but I have to say that our most favorite was the Cucumber Yogurt Salad, which had house spices and a touch of fresh mint. LOVE! Along side was a plate with Turshi, a combo of pickles, olives and turnips. I never knew pickled turnips tasted so good! Our next course was a plate of Hot Mezza! We tried their Falafel, Cauliflower (seasoned and fried), along with the Cheese Fatayer. This is a lightly fried dough, stuffed with Mediterranean cheeses. As expected, we loved them all. The Cauliflower was probably our favorite. The flavor was amazing!